Earn $1,000+ per month, baking out of your home kitchen. The step-by-step personalized path to make money off of your homemade baked goods - zero business experience required! Our simple, easy to follow plan requires zero business experience! Are you struggling to take the first step? Worried about not having a business degree? We know you’re amazing at baking, just need a bit of help on the business side of things. Hey there! I'm Michelle Wax - founder of Kitchen Millie. I started Kitchen Millie from my home kitchen in 2014, and had no idea what I was doing. I wasted THOUSANDS of dollars. I made a HUNDREDS of mistakes. I wasted MONTHS of my time doing the wrong things. If I had someone to guide me through the process. …someone who had been there before. …someone who knew what they were doing. …someone who was successfully running their own baking business. Am I following the right path to success? The online course to make money off of your homemade baked goods - with zero business experience. Apply for Hobby to Business Now! A few of the places we've been featured! Are you nervous to start? Scared that you will fail? In this module, you'll work learn how to cultivate an unstoppable mindset -- one that will propel you through all the doubt and setbacks you'll encounter along the journey as you start your own baking business. We chat through time management, productivity tactics, burnout, energy based work, and accountability. How do you know if your business will succeed? What’s the best way to plan before launching? How do I know when I’m ready to launch? In week two, you'll learn how to validate your idea and product -- and why we hate business plans. We'll guide you through our time tested step-by-step plan to make sure you have a good product, and one that people will actually pay for. We'll also reveal our business planning strategies that allow you to be nimble and adaptable as you grow. How much will this actually cost me? How should I price my products? How do I make real money? In this module, we'll walk through unexpected sources of startup funding (even if you don't have much money to spare...we started Kitchen Millie with $300), how to price your products so you're actually making a profit, and the biggest money wasting behaviors that first time entrepreneurs go through. How do I package my products? What labels do I need? Okay, so now you have a great product and are all registered and set up -- how do you get the word out?? Week 5 is all about social media, email marketing, reaching your target customer, and overall branding to make an impact. We share what works and what you can ignore (HINT: it's not what you expect). We also walk through packaging and labels, what you need to get FDA approved, and more. What to use to keep your product super fresh and looking pristine. I'm scared of selling...how do I get past that? I'm not a pushy person...how will I sell my product? Questions about The Baking Business Course? Email me directly at michelle@kitchenmillie.com. A few photos from over the years! 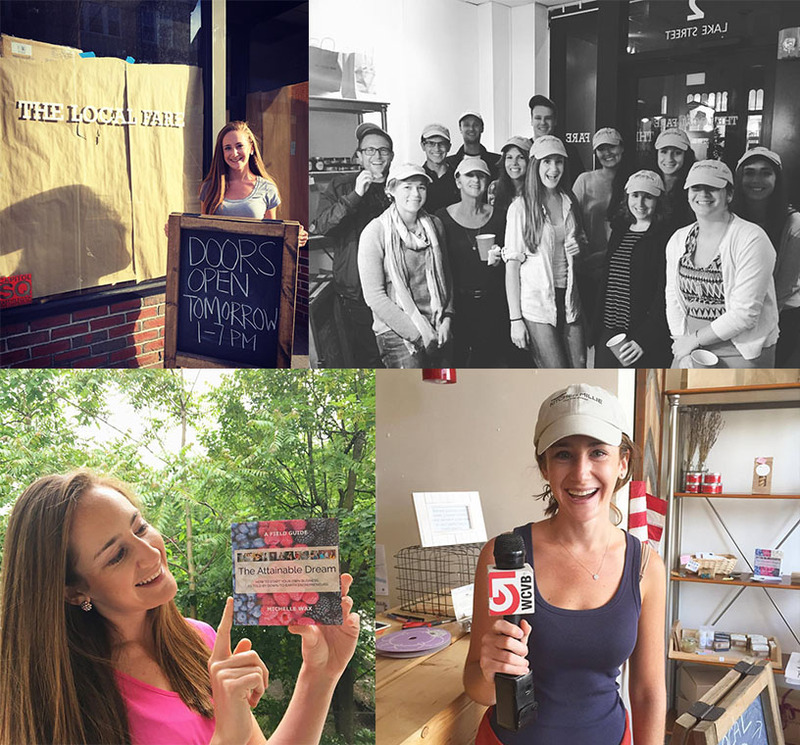 Since starting Kitchen Millie in 2014, I've worked with dozens of small food businesses to launch, grow, and expand their businesses. I struggled when starting out and wasted THOUSANDS of dollars on things that simply didn't work. In The Baking Business course, I share all the mistakes I made, so you don't have to go through them (or waste thousands of dollars)! More importantly, I share what worked in growing Kitchen Millie from $0 to a six figure business with just a few hundred dollars in startup costs. It's a clear path to launching and growing a successful baking business. The majority of people I've helped have little to no business experience, just absolutely love baking. Without sales and profit, you simply do not have a business, so we focus heavily on targeting our dream customers, and making sure we are focusing on acquiring as much profit as possible. In 2017, I wrote The Attainable Dream Field Guide to help motivate people into starting their own businesses. The AD Field Guide is a compilation of over a dozen interviews from Boston-area entrepreneurs on the mistakes they made, insight gained, and general advice for people who want to start their own business. Their advice also went into the making of the Hobby to Business course, along with my own personal experience growing Kitchen Millie from $0 to a six figure business. I'm also the co-owner of The Local Fare, a shared commercial kitchen and incubator for up and coming food brands and storefront with the best Boston-area gifts + products. With new businesses joining our community each month, it's awesome to see people going after their dreams each and every day. I am SUPER excited to share all I've learned with you and help on your way to starting your very own baking business! We only accept a limited amount of students each month, to make sure you're receiving the personalized attention you deserve.